Here we have Commodore 64 royalty, folks! 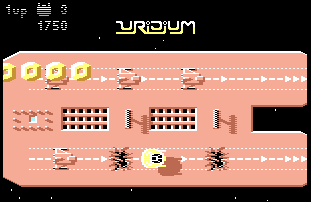 The legendary Uridium, designed & coded by Andrew Braybrook and released by the equally legendary software house, Hewson. This game oozes class from every pore along with beautiful bas-relief graphics and super-smooth scrolling. I'm not so sure about its longevity though as the gameplay can get a bit samey as you progress through the levels, but at the time of its release, it was quite simply head and shoulders above anything that had come before it.